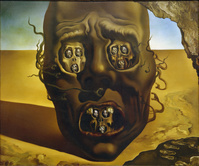 作家名： サルバドール・ダリ ( 1904年 - 1989年 ) 国籍： スペイン ジャンル　： シュルレアリスム Dali, Salvador 1904–1989. "Das Gesicht des Krieges", 1940. 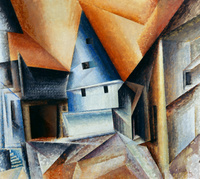 Öl auf Leinwand, 64 × 79 cm. Rotterdam, Museum Boymans-van Beuningen. 作家名： ヒエロニムス・ボス ( 1450年頃 - 1516年 ) タイトル：「放浪者」 国籍： ネーデルラント　フランドル 所蔵： ボイマンス美術館 ジャンル： ルネサンス　初期フランドル派　初期ネーデルランド絵画 The Wayfarer (or The Pedlar or The prodigal son), ca 1494, by Hieronymus Bosch (ca 1450-1516). 作家名： ヒエロニムス・ボス ( 1450年頃 - 1516年 ) タイトル：「放浪者」 国籍： ネーデルラント　フランドル 所蔵：ボイマンス美術館 ジャンル： ルネサンス　初期フランドル派　初期ネーデルランド絵画 The Peddler (The Parable of the prodigal Son). 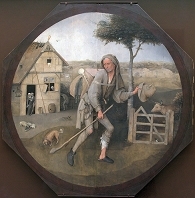 Artist: Bosch, Hieronymus (c. 1450-1516) Location: Museum Boijmans Van Beuningen, Rotterdam. オランダの画家 ジャンル: バロック Rembrandt, Harmensz van Rijn 1606 - 1669. 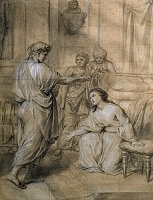 "Titus", 1655. Oil on canvas, 77 × 63cm. Photo: AKG Photo Rotterdam, Museum Boymans-van Beuningen. Mondrian, Piet, 1872-1944, Dutch painter. "Composition with coloured areas", 1917. Oil on canvas, 48 x 61.5 cm. Rotterdam, Museum Boymans-van Beuningen. Han van Meegeren. 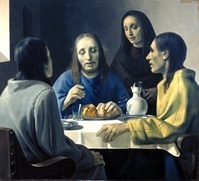 The Supper at Emmaus. Credit: Album / Fine Art Images. 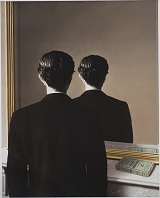 Copyright: This artwork is not in public domain. It is your responsibility to obtain all necessary third party permissions from the copyright handler in your country prior to publication. Kandinsky, Wassily 1866–1944. 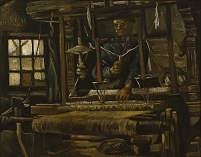 "Brun supplémenté", 1935. Oil on canvas, 81 × 100cm. Rotterdam, Museum Boymans-van Beuningen. 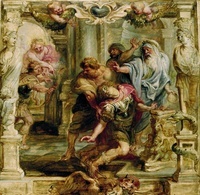 Rubens, Peter Paul. 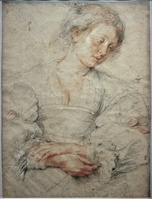 Flemish painter, 1577–1640 (circle of Rubens). 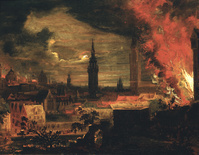 – "Fire in a town at night", c. 1640. Painting. Oil on wood, 38.5 × 45 cm. Rotterdam, Museum Boymans-van Beuningen. 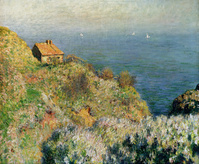 Monet, Claude. French painter; 1840–1926. "The Customs Officer’s Cottage at Varengeville". Oil on canvas, 60 × 78 cm. Rotterdam, Museum Boymans-van Beuningen. Kandinsky, Wassily, 1866–1944, Russian painter. "Capricious", 1930. Oil on card, 40.5 x 56 cm. Rotterdam, Museum Boymans-van Beuningen. 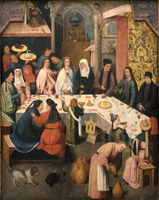 The Marriage Feast At Cana, ca 1550-1565. 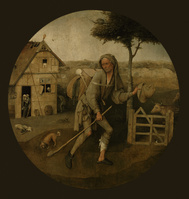 Artist: Bosch, Hieronymus, (School) Found in the collection of the Museum Boijmans Van Beuningen, Rotterdam. Kandinsky, Wassily, 1866–1944, Russian artist. 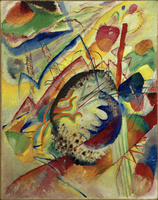 "Untitled Improvisation II", 1913. Oil on canvas, 100 × 78 cm. Rotterdam, Museum Boymans-van Beuningen. 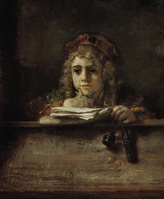 オランダの画家 ジャンル: バロック Rembrandt, Harmenszoon van Rijn. 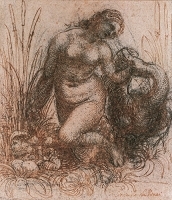 1606-1669. "The Holy Family in the Workshop", c. 1648/49. Pen and brown ink, 173 × 227 mm. Rotterdam, Museum Boymans-van Beuningen. Renoir, Auguste 1841–1919. "Two women", 1890. Black crayon and pastel, 47.7 × 31cm. Rotterdam, Museum Boymans-van Beuningen. 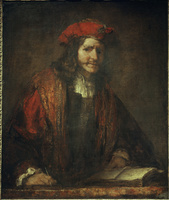 Rembrandt, Harmenszoon van Rijn 1606–1669. 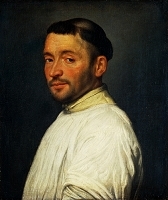 "Portrait of a Magistrate", c. 1665. Oil on canvas, 102 × 80 cm. Inv. no. 2113 Rotterdam, Museum Boymans-van Beuningen. Kandinsky, Wassily 1866–1944. "Sunday (Old Russian) ", 1904. Oil on canvas, 45 × 95 cm. Inv. No. St 108 Rotterdam, Museum Boymans-van Beuningen. Klee, Paul. 1879–1940. 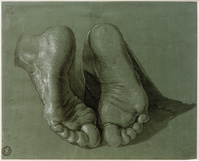 "relativ-wägbares" (Relatively weighed up), 1930.3. Watercolour and gouache on primed paper, 33.5 × 31cm. Rotterdam, Museum Boymans-van Beuningen. Kandinsky, Wassily 1866–1944. 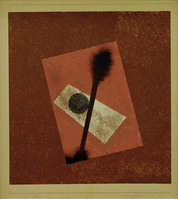 "Black Triangle", 1925. Oil on card, 79 × 53.5cm. Rotterdam, Museum Boymans-van Beuningen. Kandinsky, Wassily. 1866–1944. "White Incisiveness", 1930. Oil on card, 70 × 48.5cm. Rotterdam, Museum Boymans-van Beuningen. Renoir, Auguste 1841–1919. 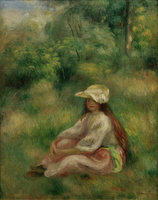 "Jeune fille en rose dans un paysage" (Girl dressed in pink in a landscape), c. 1895. Oil on canvas, 40.5 × 31.5 cm. Private collection. Rotterdam, Museum Boymans-van Beuningen. 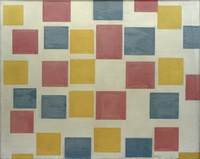 Mondrian, Piet 1872–1944. "Composition No. 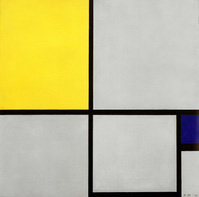 II; Composition with yellow and blue", 1929. Oil on canvas, 52 × 52cm. Rotterdam, Museum Boymans-van Beuningen. Bosch, Hieronymus, 1450 – 1516, Dutch draughtsman and painter. 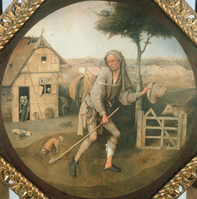 'The Wayfarer' (The prodigal son). Painting. Wood, diameter: 71cm. 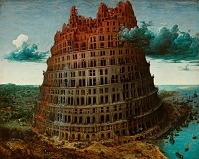 Rotterdam, Museum Boijmans Van Beuningen. 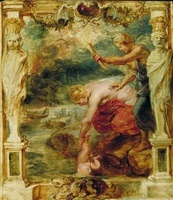 Rubens, Peter Paul 1577–1640. "The martyrdom of St. Livinus", c. 1635. (Oil sketch). Oil on wood, 82 × 57cm. Rotterdam, Museum Boymans-van Beuningen. Kandinsky, Wassily 1866–1944. "Lyrical" (Rider on a Horse), 1911. 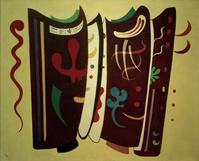 Painting, 94.5 × 130cm. Rotterdam, Museum Boymans-van Beuningen. Marc, Franz 1880–1916. "Sheep", 1914. Oil on canvas, 54.5 × 77cm. Rotterdam, Museum Boymans-van Beuningen. 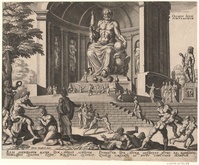 "The Statue of Jupiter at Olympia (from the series The Eighth Wonders of the World) After Maarten van Heemskerck, 1572. 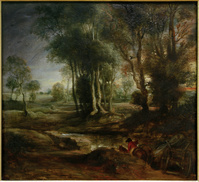 Found in the collection of the Museum Boijmans Van Beuningen, Rotterdam." 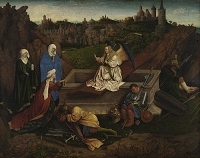 The Three Marys at the Sepulchre, c. 1440. 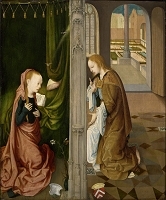 Artist: Eyck, Hubert (Huybrecht), van (ca 1370-1426) Location: Museum Boijmans Van Beuningen, Rotterdam. 作家名： フィンセント・ファン・ゴッホ ( 1853年 - 1890年 ) 国籍： オランダ ジャンル　印象派　ポスト印象派 所蔵：ボイマンス美術館 A Weaver's Cottage. 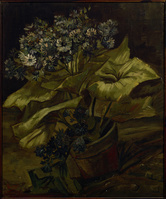 Artist: Gogh, Vincent, van (1853-1890) Location: Museum Boijmans Van Beuningen, Rotterdam. The Annunciation, ca. 1470-1480. Artist: Master of the Virgo inter Virgines (active End of 15th cen.) Location: Museum Boijmans Van Beuningen, Rotterdam. The Glorification of the Virgin, 1490-1495. Artist: Geertgen tot Sint, Jans (ca. 1460-ca. 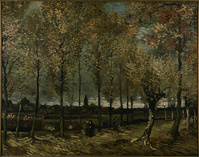 1490) Location: Museum Boijmans Van Beuningen, Rotterdam. 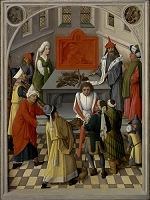 The offering of the jews, ca 1465. Artist: Master of the Gathering of Manna (active 1460-1470) Location: Museum Boijmans Van Beuningen, Rotterdam. B5HXM5 Oil paintings hanging together in Salon gallery at Museum Boijmans Van Beuningen in Rotterdam Netherlands 2008. Image shot 2008. Exact date unknown. B5JEEW Oil paintings hanging together in Salon gallery at Museum Boijmans Van Beuningen in Rotterdam Netherlands 2008. Image shot 2008. Exact date unknown.